This document provides guidelines and best practices for writing test assertions aligned with the Test Assertions Model. Test Assertions Guidelines Version 1.0. 15 August 2011. OASIS Committee Specification Draft 06 / Public Review Draft 03. http://docs.oasis-open.org/tag/guidelines/v1.0/csprd03/testassertionsguidelines-csprd03.html. This document is a non-normative guidelines document that provides best practices in using the test assertions model defined in [TAM]., as well as the test assertions XML mark-up language [TAML]. However, this document alone is sufficient for the most common test assertion design so that the reader does not need to be familiar with the above mentioned Test Assertion model and mark-up specifications. These referred specifications are only necessary for a deeper understanding of test assertion semantics or when using a formal representation of test assertions. [RFC 2119] S. Bradner. Key words for use in RFCs to Indicate Requirement Levels. IETF RFC 2119, March 1997. http://www.ietf.org/rfc/rfc2119.txt. This document is a guide to test assertions and describes a general test assertion model. Its purpose is to help the reader understand what test assertions are, their benefits, and most importantly how they are created. As you will discover test assertions can be an important and useful tool in promoting the quality of specifications, test suites and implementations of specifications. You will learn that there are many ways to create test assertions. By following the guidelines in this document you will learn how to develop well-defined test assertions that can have useful purposes and applications such as the starting point for a conformance test suite for a specification. Experiences in developing test assertions will be shared, along with lessons learned, helpful tricks and tools, hazards to avoid, and other knowledge that may be helpful in crafting test assertions. Test assertions may help provide a tighter specification: Any ambiguities, gaps, contradictions and statements which require excessive or impractical resources for testing can be noted as they become apparent during test assertion creation. If there is still an opportunity to correct or improve the specification, these notes can be the basis of comments to the specification authors. If not developed by the specification authors, test assertions should be reviewed and approved by them which will improve both the quality and time-to-deployment of the specification. Therefore, best results are achieved when assertions are developed in parallel with the specification. An alternative is to have the leader of the team that is writing test suites write the test assertions as well and to provide feedback to the specification authors. 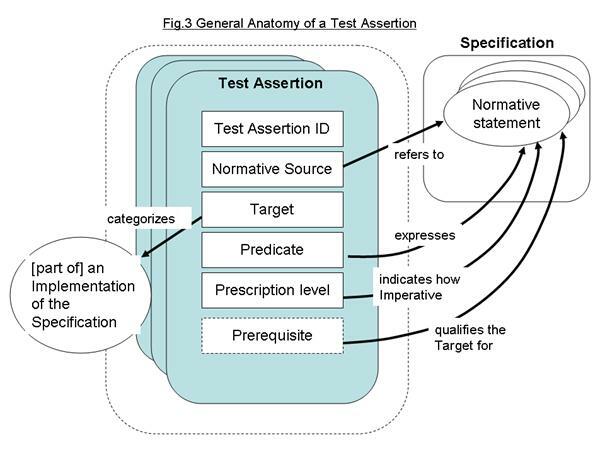 Test assertions provide explicit guidance for implementers of a specification, by stating more concretely and practically the conditions to fulfill in order to conform. Unlike test suites which can only be exercised once the implementation work is done, test assertions are usable early on during the implementation work. A Test Assertion should not be confused with a Conformance Clause, nor with a Test Case. The specification will often have one or more conformance clauses CONFCLAUSE which define various ways to conform to a specification [[VAR]] . A set of test assertions may be associated with a conformance clause in order to define more precisely what conformance entails for a candidate implementation. Test assertions lie between the specification and any suite of tests to be conducted to determine conformance. Such a test suite is typically comprised of a set of test cases. These test cases are derived from test assertions that address the normative statements of the specification. The Glossary, Section 6, will clarify further these related concepts: 'Conformance Clause', 'Test Assertion', 'Test Case', 'Test Metadata'. A unique identifier of the test assertion. It facilitates the mapping of assertions to specification statements. It is recommended that the identifier be made universally unique. · The "Target” is said to be not qualified for the Test Assertion if the Prerequisite (if any) evaluates to "false" over theTarget . · The "Target” is said to fulfill the Normative Statement addressed by the Test Assertion if the Prerequisite (if any) evaluates to "true" over the Target , and the Predicate evaluates to "true". · The "Target” is said to not fulfill the Normative Statement addressed by the Test Assertion if the Prerequisite (if any) evaluates to "true" over a Target , and the Predicate evaluates to "false". · Test assertion targets which are categorized and/or related (inheritance, composition). · Consider a combined target, here a pair [price tag and promotion item for widget X] that is identified by the widget reference number. This combination will fail or pass the test. · Select arbitrarily one object as the target, while the other will be an accessory, for example, identified by a variable. In a derived test case, a predicate failure will inevitably lead to the examination of both, should the accessory object be causing the failure. · Write two or more similar test assertions using alternately one object and then the other as the target. · Multiple (non contiguous) specification statements. · Non-textual content: tables and diagrams. · Normative statements that present some testability challenges. · The normative source is implicit, as explained in 3.2.2. This means that there is no explicit element in the test assertion pointing at the specification part that is addressed. This may be the case when the test assertion normative source can be inferred from the location of the test assertion within the specification document itself. · The specification document is itself expressed as a set of test assertions. This is possible by inserting in the "normative source" part of the test assertion, the normative statement itself instead of a reference to it. · strengthening the meaning of an assertion with additional requirements (eg. IF x THEN z => IF (x AND y) THEN z). · Two test assertions that have different target definitions (i.e. whose target elements define different categories), may apply to the same implementation or part of that implementation. · In a test assertion, a prerequisite expression may refer to other test assertions. These referenced test assertions may use a target different from the target category of the referring test assertion, assuming these categories are related, e.g. one being a subtype of the other. · A test assertion on the switch of a widget may be used as a prerequisite to a test assertion of the widget itself. For example, addressing the requirement "the gizmo must be able to stop when the switch is off (Requirement# 400)" may use as prerequisite a test assertion (called here "TA-switchworks") that addresses the requirement "A switch must cut its electrical circuit when in OFF position". If satisfied, this requirement would guarantee one can rely on a well-functioning switch, when defining the test for Requirement 400. By using such a prerequisite in the test assertion for Requirement 400, we can ensure that the switch is tested first. One way to do this is to designate a universally unique name for a set of test assertions and to include this name along with the identifier when referencing the test assertion from outside of this set. Just as we have done with the examples, it is useful to create and follow a scheme or convention when assigning test assertion identifiers. 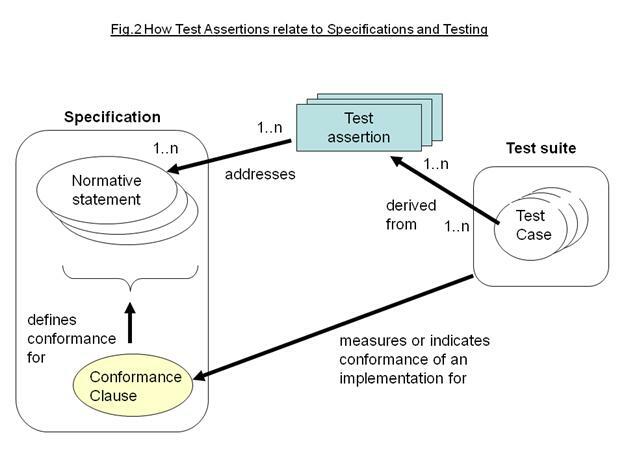 In the examples in these guidelines, the test assertion identifier is based on a combination of broad target category and specification requirement reference number, suffixed with extra characters because it is worth remembering that there is likely to be a many-to-many relationship between specification requirements and test assertions.